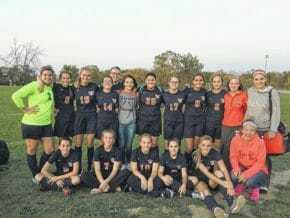 RAWSON — The first girls soccer season in Galion High School history came to an end on Monday. The Tigers drew the Cory-Rawson Hornets in the first round of sectional play. Cory-Rawson defeated Galion, 10-0, to put an end to the first chapter of the program’s history. The Tigers’ offense was stifled by the Hornets, as Galion was unable to get a single shot off on goal. Drucilla Singer began the match as the Tigers’ goalie. The Hornets were able to get seven shots to the back of the net. Allison DeNero allowed three goals, while saving six. On the plus side, the girls soccer program did have two athletes make all-conference teams in the Mid-Ohio Athletic Conference. Senior Natalie Rodriguez was named to the second team of the MOAC and DeNero, also a junior, was named an all-conference honorable mention. The Tigers will lose just three seniors to graduation this spring. Coach Eric Palmer offered up his thoughts on the first year of soccer at Galion High School, as well as his team’s chemistry.